This skull belonged to Australopithecus sediba, a new hominin species recently discovered in South Africa. The two million year old fossils are some of the most complete ever discovered, and they could rewrite our evolutionary family tree. "The fossils demonstrate a surprisingly advanced but small brain, a very evolved hand with a long thumb like a humans, a very modern pelvis, but a foot and ankle shape never seen in any hominin species that combines features of both apes and humans in one anatomical package. The many very advanced features found in the brain and body, and the earlier date make it possibly the best candidate ancestor for our genus, the genus Homo, more so than previous discoveries such as Homo habilis." Even better, these might just be the most accurately dated bones in the entire hominin fossil record. Analysis of the surrounding rocks indicate that they date back to a reversal of the Earth's magnetic field, which we know occurred between precisely 1.977 and 1.98 million years ago. That means we can date these fossils to within just 3,000 years, which is practically unheard of for such an ancient find. At just under two million years old, these specimens predate the emergence of Homo erectus by about 200,000 years, and it's also about 100,000 years older than the oldest known Homo habilis fossil. It's harder to establish concrete dates for when Homo habilis evolved versus Australopithecus sediba - both could have evolved anywhere between about 2.5 and 2 million years ago, and that's a pretty massive span of time. But it does appear that Australopithecus sediba played a pivotal role in the emergence of the later Homo genus. 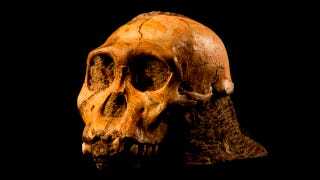 That would indicate that it either predates Homo habilis or that habilis doesn't actually belong in that genus after all, which some paleontologists such as Richard Leakey have long argued. Before we continue, it might be good to quickly explain the differences between the Australopithecus and Homo genera. Basically, Australopithecus was significantly closer to the other apes than was Homo - it was much smaller, much less intelligent, was not strictly bipedal, and spent a lot of time in the trees. The fossils have an overall body plan that is like that of other Australopiths – they have small brains, relatively small bodies and long and seemingly powerful arms. They do, however, have some features in the skull, hand and pelvis that are found in later definitive members of the genus Homo but not in other Australopiths. However, given the small brains and Australopith-like upper limbs, and features of the foot and ankle, the team has felt that keeping this species in the genus Australopithecus was the conservative thing to do. Nevertheless, sediba is turning out to be one of the most intriguing hominins yet discovered, and it certainly shows a mosaic of features shared by both earlier and later hominins. A key reason for sediba's suddenly privileged position is its hands. Although they were probably primarily used for moving swiftly through the trees - a distinctly non-Homo behavior - the hands also appear capable of the precision grip, which means they were capable of making tools. We know that these particular fossils postdate the first recorded evidence of tools. The sediba hands are the most complete in the fossil record until the time of the Neanderthals, more than a million years later, which allows for remarkably fine-grained analysis. It appears that Australopithecus sediba actually had a hand better adapted for tool-making than did Homo habilis, including the original 1.75 million year old find that defined Homo habilis - literally "handy man" - in the first place. This doesn't mean that Homo habilis wasn't actually making tools - that 1.75 million year old hand was found near stone tools, which is partially why the species became so intrinsically associated with tool-making. But Australopithecus sediba does appear to represent a much stronger transitional stage between the tree-dwelling earlier Australopithecus species - including the famous Australopithecus afarensis specimen Lucy, who dates back 3 million years - and later tool-makers like Homo erectus. So then, let's say we remove Homo habilis from our direct ancestry - perhaps recategorizing it as Australopithecus habilis, but that's another argument for another decade - and slot in Australopithecus sediba as the direct ancestor of Homo erectus. What else can this new find tell us? One of the most intriguing finds has to do with brains and bipedalism. "It's clear there could be two things driving the evolution of the pelvis in our Homo lineage. One is bipedal locomotion. Between six and two million years ago, we begin to see a lot of it. The other thing is our big brains. Our brains have to pass through the pelvis, so accommodations must be made. What's cool about sediba is their pelvises are already different from other australopiths, and yet they're still small-brained… It's hard to imagine that there's no change in locomotion behind all this." The small brains are themselves an intriguing point. While the brains do not fossilize, they do leave clear marks on the inside of the skull. From those indentations, the researchers can deduce a surprising amount about the brain. There's evidence that the front of the brain was already starting to reorganize itself into something like the modern human frontal lobe, which is one of the keys to our current intelligence. We wouldn't have expected to find a frontal lobe like that in such an ancient species, and it suggests the hominin brain didn't enlarge gradually from Australopithecus to Homo. Instead, this suggests that the later Australopiths began reorganizing their brains into something more akin to later Homo brains, and only then did the brains begin to radically increase in volume. There's a lot more still to come about this new find, and there's high hope that the Malapa site will reveal still more ancient hominin specimens. Until then, let's just welcome the newest member of our extended evolutionary family. We may have just discovered the evolutionary equivalent of our great-great-grandparent, and that's pretty damn awesome.